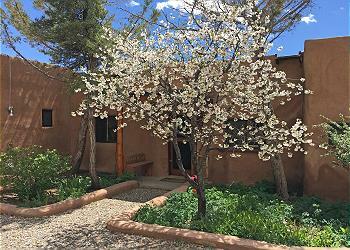 Town of Taos, New Mexico - easy 1/4 block walk to Taos Plaza. A renovated historic & charming 1 bedroom "casita" - originally "Nun's" quarters for historic "Our Lady of Guadalupe Church"
La Casita, nestled near most popular happening in “The Town of Taos” which is one quarter block from “Plaza”. 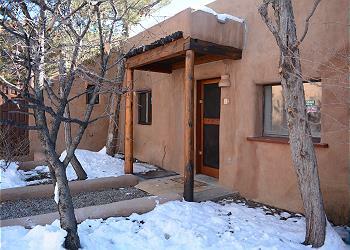 Located on a quiet private one way street only ¼ block from the heart beat of town which is the “Taos Plaza”. Walk to town in less than 5 minutes. Lined with shops, restaurants, galleries and more, the Plaza is also where outdoor entertainment and public events take place. During summer months, locals and visitors look forward to gathering Thursday’s late day / early evening for live “Music on the Plaza” including dancing and festivities. During winter holidays, the Plaza is alive with holiday décor, music, gatherings and the ever popular “Lighting of Ledoux Street” with galleries, artist studios and the famous Harwood Museum announcing the beginning of Christmas / New Year holidays. which is populated. 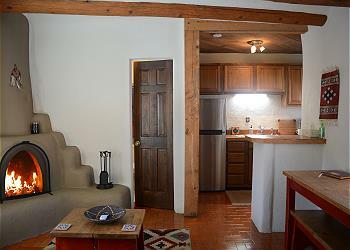 La Casita is one very short block from Ledoux Street. 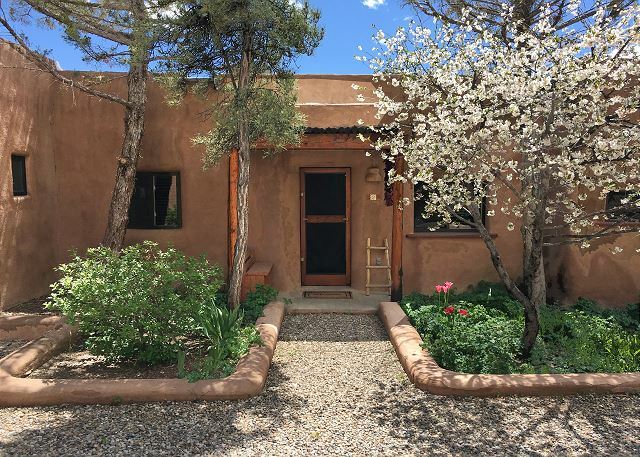 One block from Kit Carson Road & Main Street (named Paseo del Pueblo Sur) and Bent Street with more shops and galleries and eateries. 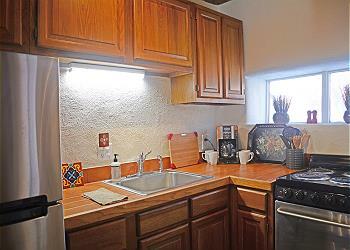 All of this and more are available with a 5 or 10 minute walk. 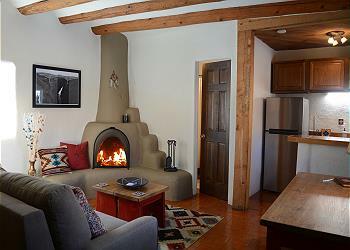 When you simply want to chill and pretend you live in Taos, stay home and relax by the historic wood burning kiva fireplace and enjoy this absolutely charming historic “La Casita”. 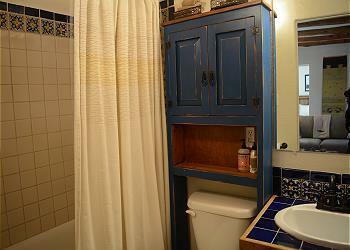 Read a book or watch either of the two HD flat screen DirecTV’s (one in the living room and one in the bedroom). 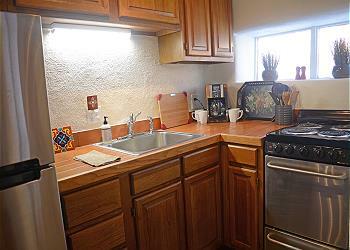 Like the rest of the casita, the kitchen is furnished with upscale everything, including stainless steel fridge and stove, upscale pots, pans and dinnerware. 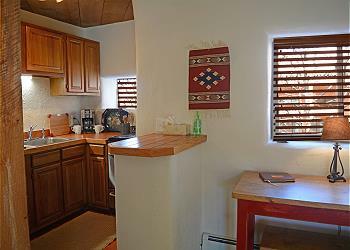 Much of the furniture was designed special for La Casita and handcrafted by a local Taos woodworker. The interior of the casita is pretty much “sound proof from the world” due to the thick historic adobe walls. 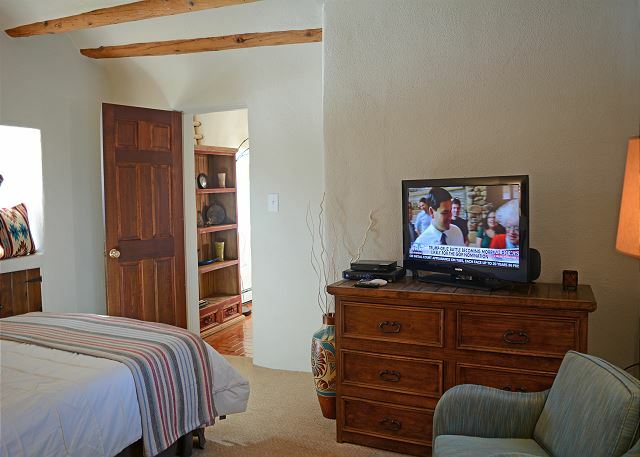 These same sound proof walls insulate year round, keeping the casita cool during summer and warm during winter. The memory foam Queen bed is luxuriously comfortable and dressed with upscale linens, pillows and topper. The state of the art sleeper sofa is an “American Leather Comfort Sofa” touted by many guests over the last 10 years as, “The best night’s sleep ever” and “way better than most beds”. To experience Taos fully, one must spend time in the heart of the city. 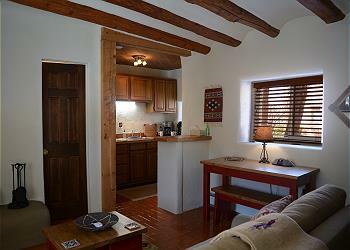 Lodging at “La Casita” provides guests the opportunity to enjoy all of this with ease and off street parking. You will feel like you live on “The Square” but are buffered with privacy and solitude when you walk through the front door. 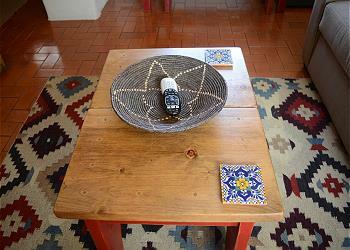 Enjoy lodging at La Casita and you will tell your friends and family they have to come and do the same…..